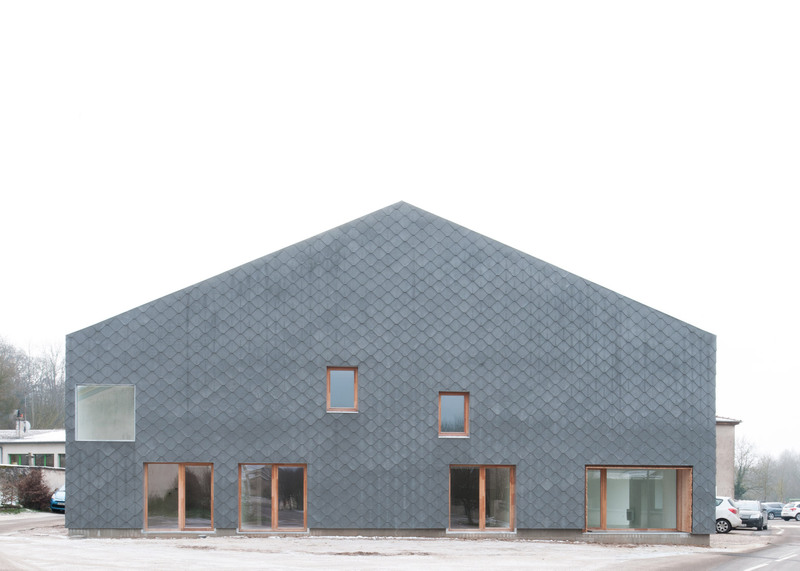 Fibre-cement shingles cover this gabled barn in northeast France, which GENS: Association Libérale d'Architecture has converted into five apartments (+ slideshow). The badly deteriorating barn, which adjoined the town hall in Velle-sur-Moselle, was bought by the local council after the death of its owner. 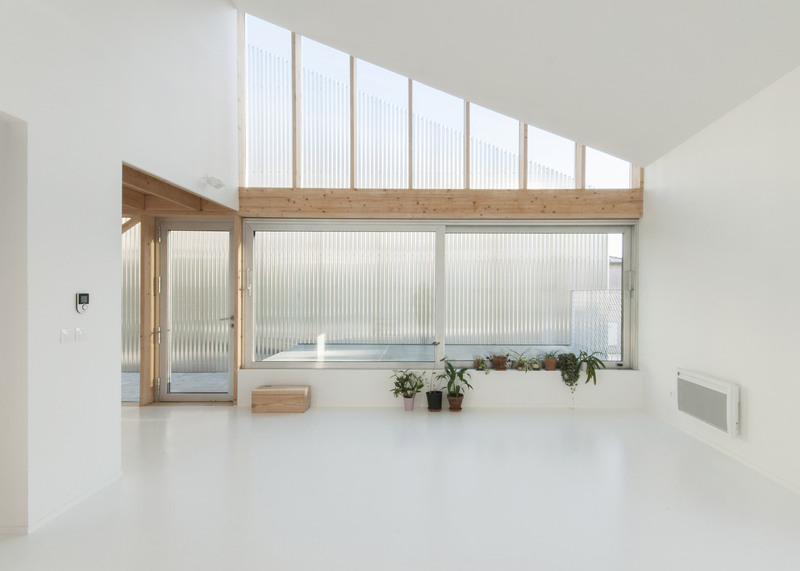 The French architecture studio was asked to adapt the existing building to create three ensuite bedrooms with shared facilities for elderly residents at ground level and a pair of maisonettes above. The social housing scheme is designed to allow elderly people to remain in the village once they are unable to care for their former homes. A slice was cut from the barn building to separate it from the town hall and a small extension added to one side. The whole block, known as South, was then covered in grey shingles. 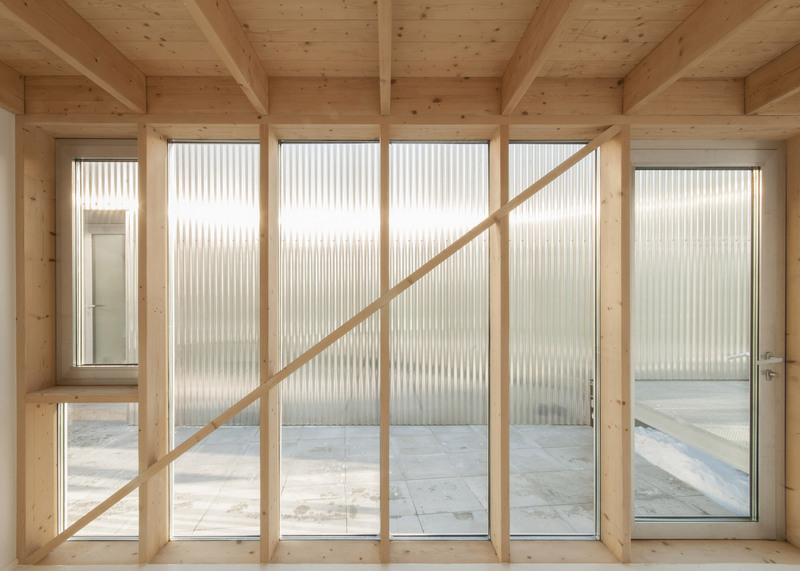 Guillaume Eckly, who is one of five architects at the studio, explained that while fibre cement might not be the most popular material, its common use in the area helps to disguise the structure in its surroundings. "We wanted to 'hide' the project within this very banal look," he told Dezeen. "Something that would ultimately look old and a bit shabby, like any village. And of course it has a wonderful presence: fabric like, changing softly with shadows or dew." 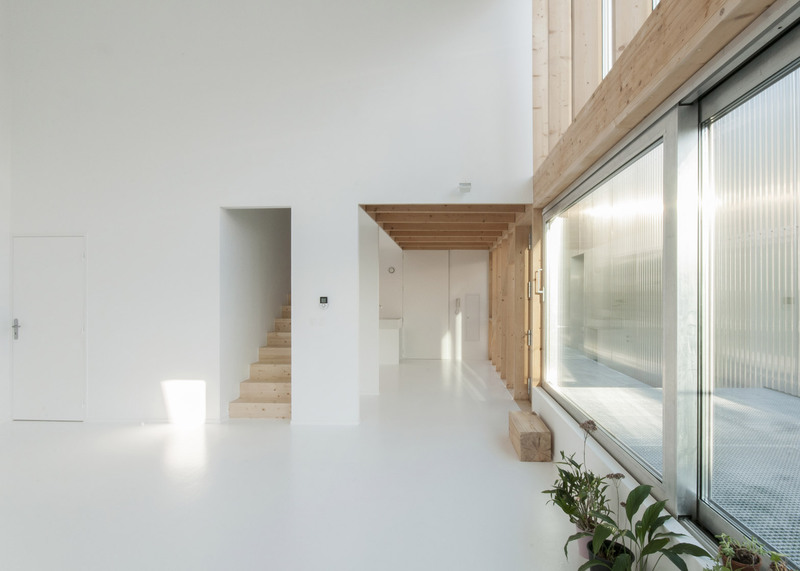 "The extension is barely visible at the end, because it just scales up the existing volume of the barn." A glazed passage links the apartment block and town hall, and a narrow well allows natural light into the depth of the building. While three sides of the apartment building are shingled, this fourth facade facing the gap is clad in shiny corrugated aluminium, selected to give it a simultaneously contemporary and agricultural appearance. "This fits the countryside characteristic of the place," said Eckly. Wooden window frames with a scrolled motif are intended to create a further visual link between contemporary and traditional styles. 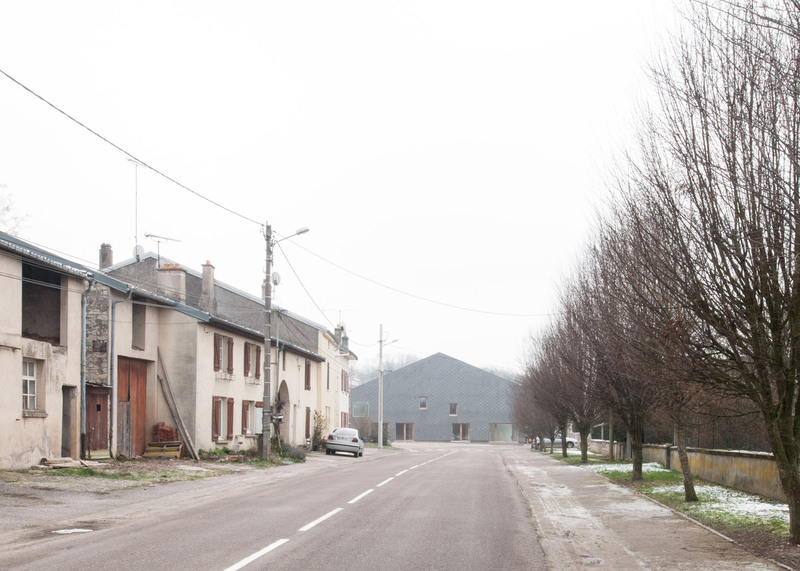 French studio Yoda Architecture also used panels of corrugated metal to clad the field-facing gable of a house set in the countryside near Lille, while its street frontage is made from red brick. The interiors are largely white, allowing residents to make their own stamp on the property. But a few accents of colour and exposed woodwork help to add a "rural touch," according to the architects. 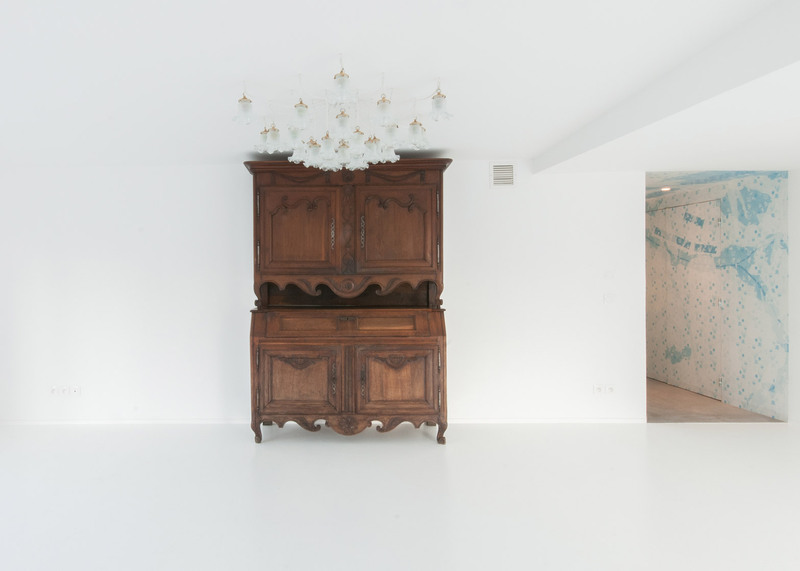 The corridor on the ground floor is decorated with a muted blue pattern – "paying respect to the tradition of overwhelming flower wallpaper one finds in old buildings" – and the kitchen has pastel pink paintwork and tiling. While shingles are typically made from wood, architects are increasingly investigating the use of more unusual materials to update the traditional cladding. Turner Prize-winning architecture collective Assemble used pastel-tinged shingles to clad an artists' studios in east London, while iridescent stainless-steel versions cover the rooftop of an office block near Paris by French studios Agence Jouin Manku and DTACC. Photography is by Ludmilla Cerveny and GENS: Association Libérale d'Architecture.